EASTON, PA (Feb. 21, 2013) – Lauren’s First and Goal Foundation today announced that registration is now available for its 2013 high school football camps in Pennsylvania and Ohio. 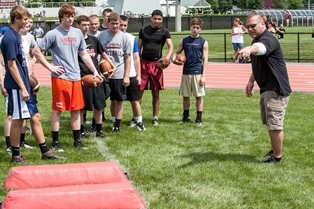 The LFG football camps are scheduled for Sunday, June 2 at Lafayette College in Easton, Pa. and Saturday, June 22 at Otterbein University in Westerville, Ohio. The camps are open to student-athletes who will be entering grades 9 through 12 in Sept. 2013. During the one-day, non-contact camp, athletes receive instruction in a variety of offensive and defensive skills from volunteer college coaches from around the country. Each camp also includes a guest speaker, which will be announced closer to the camp date. To register for the camps, student-athletes can visit www.LaurensFirstandGoal.org for a seamless online registration experience. Campers wishing to pay by check can download printable forms from the website and mail their registrations. The cost of the Pennsylvania camp is $40, while Ohio is $30, and any donation more than the registration fee is 100% tax deductible. The first 400 pre-registered campers will receive a free LFG t-shirt. More than 2,500 athletes and almost 400 volunteer college coaches, representing Division I, II and III institutions participated in last year’s camps. Since 2004, more than 12,000 student-athletes from 31 states and three countries have attended an LFG camp. The camps are the primary fundraiser for Lauren’s First and Goal Foundation, which is a 501c3 charitable organization that provides financial support for brain tumor research and cancer services, offers financial and emotional support to families living with pediatric cancer, and increases awareness of the disease. Created in 2004 by John and Marianne Loose in honor of their 16-year-old daughter Lauren, a pediatric brain tumor survivor, LFG has donated more than $1 million toward the fight against pediatric brain tumors and cancer.